From a distance, the Eads Bridge doesn’t really look like a big deal. It is, but its physical appearance doesn’t exactly tell the story. It doesn’t tower like the Brooklyn Bridge, it doesn’t stretch like the Golden Gate, and it doesn’t sparkle and look all space-agey like the new Stan Musial Veterans Bridge that now stands to the north. Once the iconic structure of St. Louis, the Eads Bridge even had that distinction wrested away by the Gateway Arch nearly fifty years ago. Everyone knows the Eads Bridge exists, but these facts can explain why many St. Louisans don’t realize what a landmark structure it is. To help realize it, imagine what a radical change that bridge must have brought to St. Louis in 1874. Before the Eads Bridge existed, a booming city of 300,000 people was difficult to get to. Most of America lay to the east, and those wanting to come to St. Louis (or anyplace west of it) had no simple way to cross the biggest, nastiest river on the continent. On a humid day in July 1874, all of that changed. Suddenly, a St. Louisan could walk, drive a carriage, or trot a horse over that big river in just a few minutes. Trains, no longer required to stop and load cargo onto ferry boats, could chug right through on the bridge’s lower level. Ice, floods, and congested river traffic suddenly became afterthoughts to travelers wishing to cross. Even for the average family taking a Sunday stroll on the upper deck, the Eads Bridge provided an entirely new way to look at the city they lived in. And it was built by a man who had absolutely no experience building bridges. James Eads, nationally known for his work on or under water, had never built anything that stood above water. This may explain why Eads’s bridge design, unveiled to the public in 1867, was unlike anything that had been seen. When it was completed seven years later, it would stand as one of the most remarkable structures constructed in the 19th century. In its construction, James Eads would repeatedly make civil engineering history. Ingenuity and business acumen aside, Eads was also looking out for the future of his city. Already losing ground to Chicago in the race to tie the nation together with railroad tracks, the pieces finally came together for a St. Louis bridge in 1867. It’s a long story (read Jackson’s Rails Across the Mississippi for the extended version), but as contracts and bridge companies started bubbling to the surface, Eads became convinced that outside interests, primarily Chicago, were in control. He was probably right, but more importantly, Eads believed the competing bridge designs were vastly inferior to his. James Eads knew the Mississippi, and James Eads knew what it could do to a poorly designed bridge. Despite his reputation and overwhelming public support, many had serious doubts about the feasibility of Eads’s design. After being urged to have an expert review his plans, Eads showed the initial design to Jacob Linville, a respected bridge engineer of the time. His review was anything but glowing. Eads brushed off such criticism and continued finalizing his design. Inspired by the Koblenz Railroad Bridge in Germany, Eads settled on a ribbed arched design. Eads explained that it offered a “beauty and economy” over the standard truss bridge employed frequently at that time. It was just one way in which Eads was pushing the boundaries of bridge construction, but he was actually required by law to do so. Before Congress authorized the construction of several bridges over western rivers, the steamboat industry had lobbied extensively to limit or prevent railroad bridges from being built. As a result, several restrictions were put in place, making the construction of a railroad extremely difficult. James Eads embraced the challenge and then took it to another level. Up to that time in history, no arched bridge had ever been built with a span of more than 500 feet. Eads designed his bridge to have three. When complete, all three of the spans utilized in the Eads bridge would be longer than any ever built. To hold them up (as detailed in the Summer of Eads Part I), two massive pneumatic caissons would be sunk to bedrock. Each of them would also be the largest ever built and each would be sunk to an unprecedented depth. Finally, James Eads made his most daring decision yet. He opted to build the superstructure out of steel, a material that had never been used before on such a massive scale. It was also expensive and difficult to make. However, advances in mass steel production, such as the Bessemer process, made steel a viable option. After studying its use in Europe on smaller projects, Eads decided to build a steel bridge. It would be the first time in history the material would be used on such a scale. In 1867, many believed Eads mad to insist on using steel. Even Andrew Carnegie, a man who would one day become the richest man in America because of steel, repeatedly urged Eads to use iron. Carnegie was a director of the Keystone Bridge Company, which had won the contract to supply metal to the project. The two men clashed repeatedly, especially over Eads’s insistence that the steel be of unprecedented quality. It must be noted that James Eads wasn’t a one man show. Aware of his own inexperience in the field, and looking to comfort cautious investors, Eads recruited several brilliant and experienced engineers to work at his side. Men such as Henry Flad, Charles Pfeiffer, and Benjamin Singleton would play pivotal roles in the design and construction of the bridge. With much of the construction work in the capable hands, Eads was able to focus on bridge finances and improving his own health. Exhausted, overworked, and teetering on collapse, Eads even tried to resign in 1868. His resignation was refused, but Eads required extended periods of leave throughout the life of the project. During these periods of recuperation, bridge construction often ground to a halt. Despite opposition to his design, poor health, and clashes with subcontractors, bridge construction commenced. On a cold and drizzled day In February, 1868, James Eads stood on the bank of the Mississippi River, gave a short speech, and watched the first limestone block settle into place. Bridge construction had finally begun. Two years later, the massive stone piers that would support the bridge rose out of the water (as detailed in Part I). Construction could now begin on the steel superstructure. It would mark another moment in engineering history. The superstructure of the bridge was built using a cantilever method of support. Soon, arches of steel tubing stretched out from each pier without any support from below. Again, this method of bridge construction had never been done before on such a scale. Despite progress on all fronts, James Eads continued to be challenged by adversaries. As late as 1873, the steamboat industry hurled one final legal challenge. Claiming the bridge would present a “serious obstacle to river navigation”, the bridge was deemed illegal by the Army Corps of Engineers. But since the bridge was nearly complete, they demanded Eads dig a channel on the Illinois side so river traffic could circumvent the bridge. Furious at the suggestion, Eads reached out to a friend that owed him a favor. As detailed previously in the Summer of Eads, Part III, Ulysses S. Grant, now President of the United States, had benefited greatly from Eads’s ironclad gunboats in the Civil War. When Eads asked Grant to weigh in on the matter, Grant bluntly overruled the Army engineers. Bridge construction could now proceed as James Eads wished. Bridge construction continued over the next three years. Supervised by Eads’s first assistant Henry Flad, the steel arches stretching out from each pier inched closer together. On September 15, 1783, the final steel tube was lifted from below and squeezed into place. Suddenly, the light at the end of the tunnel poked through. With the two largest construction hurdles cleared (the sinking of the piers and the successful spanning of the first arch), the structural integrity of Eads’s bridge was assured. Detractors of Eads’s vision were silenced, the last financial hurdles were cleared, and the road over the river unfurled. In July 1874, the bridge was set to open. To prove it would hold, an elephant was marched across. After William Tecumseh Sherman drove in the final railroad stake, trains crossed for the first time. Finally, on July 4, 1874, on the day of the country’s 98th birthday, the city officially opened the Illinois and St. Louis Bridge. Despite a sweltering 102 degrees, the city teemed with joy and celebration to mark the occasion. With visitors in town from near and far, over 300,000 people turned out to see a parade that stretched over fourteen miles. Rows of cannon were placed on each side of the river. As the cannon fired salutes, trains carried revelers across the river and dignitaries gave speeches. James Eads was at the center of it all. His role in the project wasn’t lost on anyone. The St. Louis Republican proclaimed in print “James B. Eads stands today the foremost man of his time.” When James Eads was asked to weigh in on his creation, his response is one that only a man of supreme confidence could offer. My idea for an Eads Bridge drink goes all the way back to my friend that I introduced in The Summer of Eads, Part I. Amanda Clark, who runs Renegade Tours STL, is the guilty party in getting me to think non-stop about James Eads and his bridge. She also gave me the idea of how to drink to them both. It’s this quote, written by Walt Whitman when he visited St. Louis in 1879. The bridge was only five years old a the time, and it mesmerized the famous poet. He’s got that right. 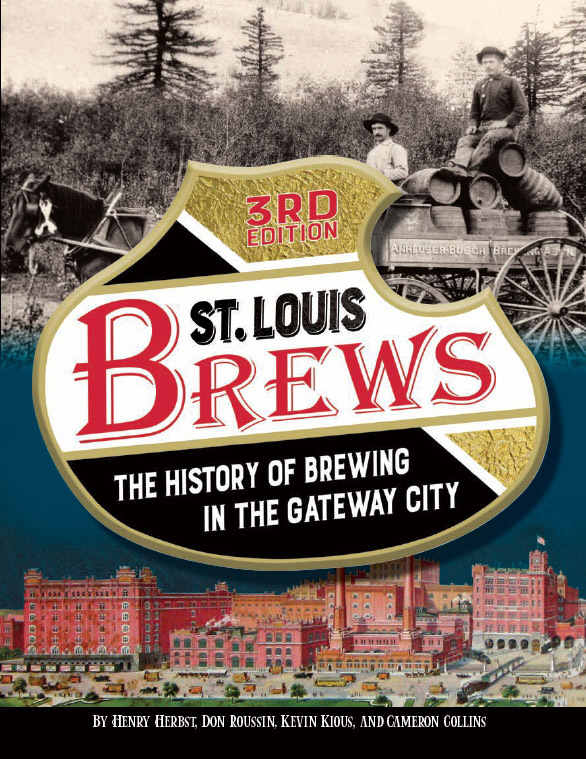 With InBev (Budweiser) and the recent explosion of craft breweries here, St. Louis is undoubtedly a great beer town. Even better, the house where Whitman stayed during his visit (belonging to his brother Thomas), was located on Pine Street. If it stood today, it’d be a stone’s throw from Schlafly’s Tap Room. It took Walt Whitman’s love for Eads’s masterwork to find a drink, but that’s good enough for me. Besides, I’ve always been a big fan of Schlafly. The first of the microbreweries in St. Louis, I have probably spent thousands of dollars over the years at their Tap Room and Bottleworks facilities. I know I’ll be back to both locations often to drink their good beer. As for James Eads, I’m not done with him either. He has plenty of additional stories to tell, but it’s time to bring the Summer of Eads to a close. And as I’ve mentioned in the other posts in this series, Eads wasn’t exactly the easiest guy to drink with. With that in mind, it’s time to mix a cocktail and find some good St. Louis history. Just found your blog! Loved the “Summer of Eads” series. Found your blog, via a search for “Pictorial of St. Louis”, which has always intrigued me. Thanks! Eads was fun to write about. The guy was simply amazing. I’ll have a few more posts about him in the future. I ride the Metrolink over from Illinois every morning, which uses the bridge, so this series was a perfect topic. Also, I’m a big fan of this site. Keep up the good work!